Forget mass-produced convenience food. Being “local and organic” is a way of life at Table Nectar. “The farm-to-table movement is about knowing where our food comes from and enjoying produce, meats and locally made products that haven’t travelled halfway around the world, but were instead grown or produced in our backyards and communities,” says Kimberly Medici, chef and owner at Table Nectar. Medici calls farm-to-table “conscious eating” and explains it’s local, pesticide-free and can help making and preparing food fun, since there are so many colors and flavors to choose from. “It’s quality over quantity and healthier choices combined,” she says. In the spring, Table Nectar’s farm-to-table menus include balsamic beet crostini with oven-roasted South Fork Farm’s baby beets and arugula, Jollity Farm’s fresh goat’s chevré, Mad Dog Mesa’s extra virgin olive oil and balsamic reduction; Flying Mule Farms’ slow braised lamb shank served with Riverdog Farm’s roasted fingerling potatoes, grilled spring asparagus, and creamy truffled polenta from Grass Valley Grains; and for dessert, orange cardamom creme brulée, made with Local Yolk’s pastured eggs, Clover Stornetta cream, and Hooverville Orchards’ fresh citrus. Costs might get better as farm-to-table gets even more popular. “The good news is that the more we support our local food systems and organic farming, the greater the demand will be, and the more affordable it will get,” says Medici. Wash all fresh ingredients thoroughly. Remove stems from the kale, as they tend to be slightly tough and woody when served raw. Bunch up or stack the de-stemmed greens and thinly slice them to about 1/4-inch thickness. Place them in a medium-sized mixing bowl. Add ingredients (olive oil through cider vinegar) directly to the kale; wash hands, and then thoroughly massage the dressed greens mixture with your hands. Massage the greens with the same intensity you might tenderize meat with a mallet. By doing this, the acids in the dressing act to gently tenderize and “cook” the kale without loosing any flavor or nutrients. This is the fun part, so don’t be afraid to really get in there! Prep all of the remaining ingredients. Using a food processor with a shredding attachment works most quickly; otherwise, shred the carrots and beets by hand. The apples can be sliced, diced or shredded, whichever you prefer. 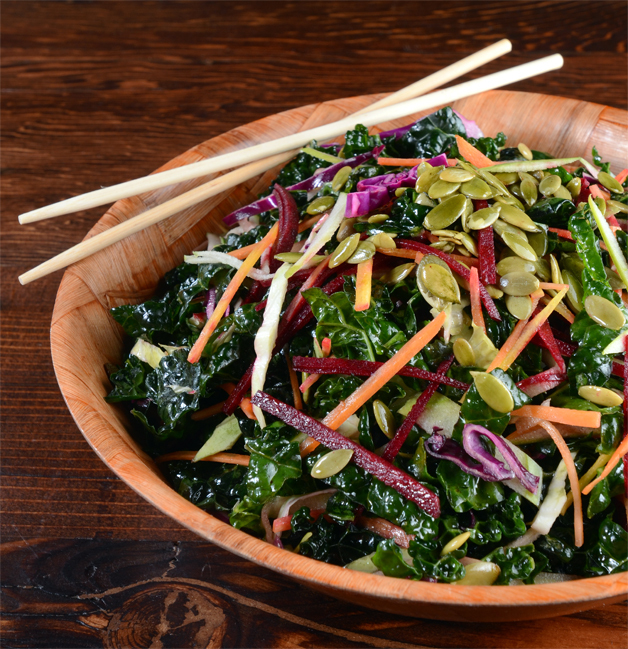 Add the cabbage, carrots, beets and apples to the kale mixture and gently toss—mixing all ingredients throughout. If you prefer your nuts and seeds toasted, put them in the oven for about 8 minutes at 350 degrees; let them cool before folding into the salad.